Para-Stroke is a theoretical solution to identify stroke symptoms in a near-future scenario where technology has advanced in battery life, machine learning and detection algorithms. 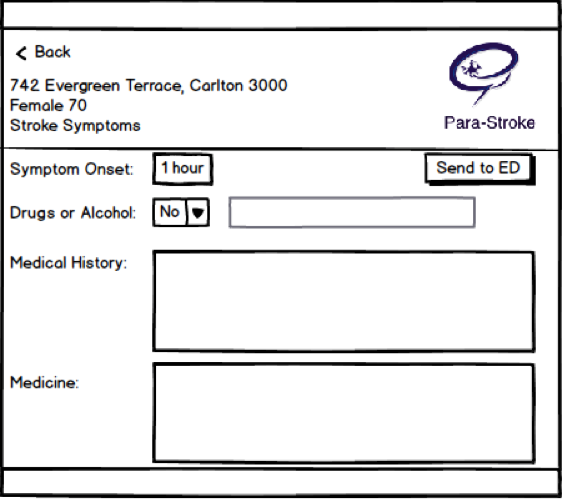 Para-Stroke would run on existing ambulance Mobile Data Terminals (MDTs) to augment data from Stroke Detector to paramedics received directly from monitoring potential stroke suffers, with the ability to forward the information on the EDs. Treatment seeking is delayed as patients do not recognise the symptoms of stroke, and/or do not appreciate stroke is a medical emergency. The gold standard treatment for ischaemic stroke is a drug called tissue plasminogen activator (tPA), which acts to dissolve the clot and restore blood flow to the affected area. This drug can only be administered within 4.5 hours of stroke onset, after which time is loses effectiveness and risks begin to outweigh benefits of administration; risk of haemorrhagic conversion increases, significantly worsening prognosis. Despite this time pressure, only 39% of patients arrive at hospital within 4.5 hours of onset, with pre-hospital delays remaining a key challenge. Further, time of onset of symptoms is often unknown as the patient is unable to report when they were last well, with significant implications for the types of treatment they will be eligible to receive. 8. Creating low-fidelity wireframes and the system design. Louise the ER Triage Nurse. Time-stamped log of symptoms detected and prior behaviour could assist doctors in determining time of stroke onset. Based on Michael’s Needs, User stories were created. Michael needs to receive additional information about the PSS so that he can target his questioning to rule out other causes for stroke symptoms. Michael needs additional information to be obvious so that he can quickly assess the patient. Michael needs to send information to the ED so that they can quickly get the PSS treatment. Para-Stroke is integrated into the existing MDT’s. Existing information regarding the address, patient gender, age and symptoms are included. 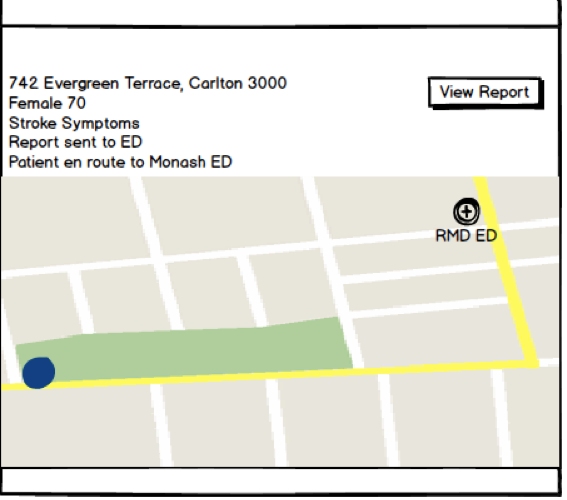 The MDT’s provide route information to the ambulance on where they are and where they are going. 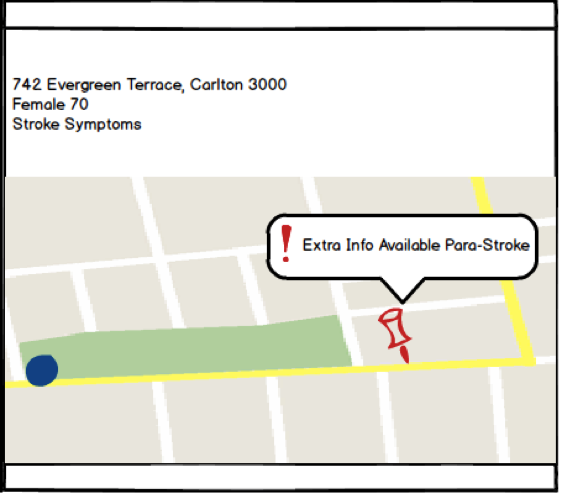 When the pickup address for the patient matches the address of a record in Stroke Eye, Para-Stroke prompts paramedics that there is extra information available. Selections have being designed to have specific affordances so Michael knows how they can be used: radio buttons were selected for gender as only one may be selected and checkboxes for symptoms logged as PSS can record multiple systems. All of these fields are updatable if they are incorrect or new symptoms now exist. If yes is selected for drugs or alcohol the paramedic must enter a free text description relating to this. They cannot proceed without providing this information; Para-Stroke will not enable them to do so, acting as error prevention. This adheres to Jakob Neilson’s usability heuristic “visibility of system status” by providing feedback; Michael is told that the system did something, sending the report to the ED, rather than leaving him to wonder regarding the system responsiveness. Clicking OK automatically takes the user back to the map view, now showing the ED and the route to the ED. This screen displays that the report was sent to the ED and they can view this report if necessary. The system presents the report status enabling at a glance assessment that the report was submitted so, with everything else going on, Michael doesn’t need to recall whether he sent the report - he can easy recognize that he did.